In order to make use of a WDC you need no programming experience what so ever. If you’re aware of a WDC you want to make use, of all you need to know is the URL to access it at. Simply select ‘Web Data Connector’ from the connection list, enter or paste the URL of the WDC into the appropriate window and follow instructions presented by the WDC. Each WDC is unique and its interface depends on how the author has designed it. 3. So how is the data stored? Is it live? While the connector may be pointed at what feels like a live database (via a web service API for instance) the data is always stored locally as a Tableau Data Extract and so is only ‘live’ at the point of connection. That doesn’t mean that the data can’t be refreshed either manually or scheduled on a Tableau Server (version 9.1 or greater), as long as the connector author has stored the relevant authentication credentials as required to continually access the resource. 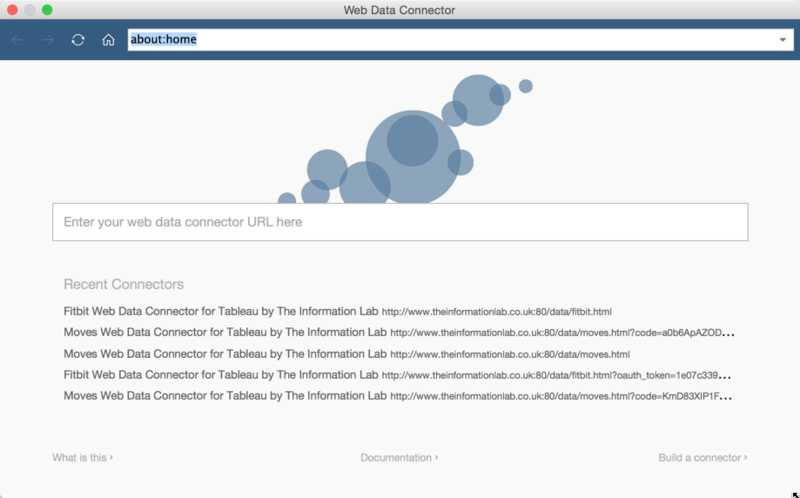 The Tableau Web Data Connector is expected to be released with Tableau 9.1 and as I type is currently available for testing by end users through the beta program (to get access to the beta program as a Tableau customer contact your account manager or email beta@tableau.com). While presence in the beta program doesn’t guarantee release in 9.1 it is a good sign. Really it depends on user feedback and unexpected instability from working with other people’s code. 5. Are there any prebuilt connectors I can play with? Sure there are! If there’s anything the Tableau community is known for it’s adopting new versions fast (even betas) and making the most of new features. To make use of one of these connectors fire up your latest beta copy of Tableau 9.1, select Web Data Connector from the connections menu, copy and paste one of the above URLs into the connector screen and follow instructions. As the beta progresses you’ll also find WDCs posted for testing to the beta community group (email beta@tableau.com for access). Thanks for posting this nice overview. I’ve come across this GitHub repository by Alex Ross a.k.a. Tableau Junkie. Explanations and live connectors via his website. We focus on the data that drives storytelling through reports, dashboards or visualizations. Tools like Tableau’s Web Data Connectors (WDC) will go a long way to help with storytelling. We are interested in hearing from people what data sources they are interested in generally and specifically what WDC they would want. Feel free to reach out at tableau@openbridge.com. I’m trying to use the fitbit connector to log in all of my colleagues as separate data sources then join to produce a team viz. First extract works fine, but then second one always hangs on extract…is this specifically disallowed by either FitBit or Tableau? Really like the prebuilt connectors! Does anyone how to connect Google sheets with Tableau on a Mac? When I use the Informationlab web connector for Quandl I am limited to 50 calls/day as an anonymous user. Is there a way to use the web connector through my Quandl account, thus upgrading to 50,000/day? Is there any limitation of how many observations of data that we can get into tableau by WDC..??? I have a problem with creating formula fields on a Web Connector to Survey Monkey. I get an error saying that the functions like SUM() are not recognised. Is this a problem with Tableau or Survey Monkey?